One of my husband’s favorite cookies growing up were the simple refrigerated chocolate chip cookie dough cookies. You take a TBSP of the cookie dough and place it in a mini muffin tin, bake, then press a Reese’s PB cup mini into the hot cookie. Voila. Dessert. To this day those are still one of his favorite cookies. 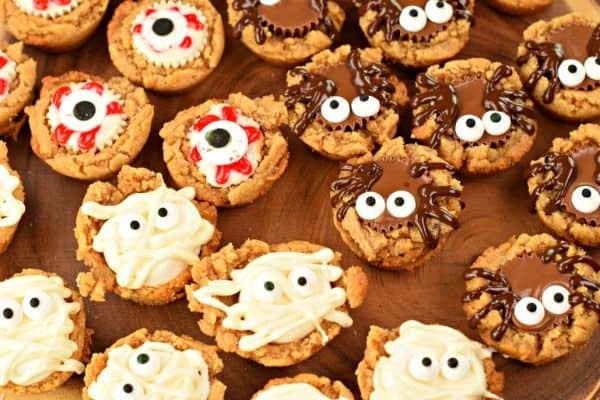 I knew I wanted to make a fun Halloween treat (I was on a roll with these Butterfinger Frankenstein Cupcakes and these Spooky Eyeball Cake Balls). Of course I had no refrigerated cookie dough on hand (do people keep rolls of this on hand??). So I did the next best thing. I made the EASIEST peanut butter cookie dough with only three ingredients. You may remember this cookie dough from these Peanut Butter and Jelly Cookies. One batch makes 24 cookie cups. You decide if that’s enough, and adjust the candy and toppings accordingly! I used my favorite non-stick mini muffin tin and sprayed it with baking spray. You can also grease your pan if you have no baking spray! Have all your candy unwrapped so you can press them into your cookie cups immediately when taking them out of the oven! Allow the cookie cups to sit in the pan for about 10 minutes, then use a butter knife and they should POP right out! For the mummy: you can use either white chocolate peanut butter cups or marshmallows (for a fun fluffernutter treat). 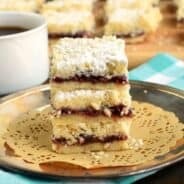 Use melted white chocolate and drizzle it on the cookie to create the scraps of cloth! Don’t forget the candy eyes! 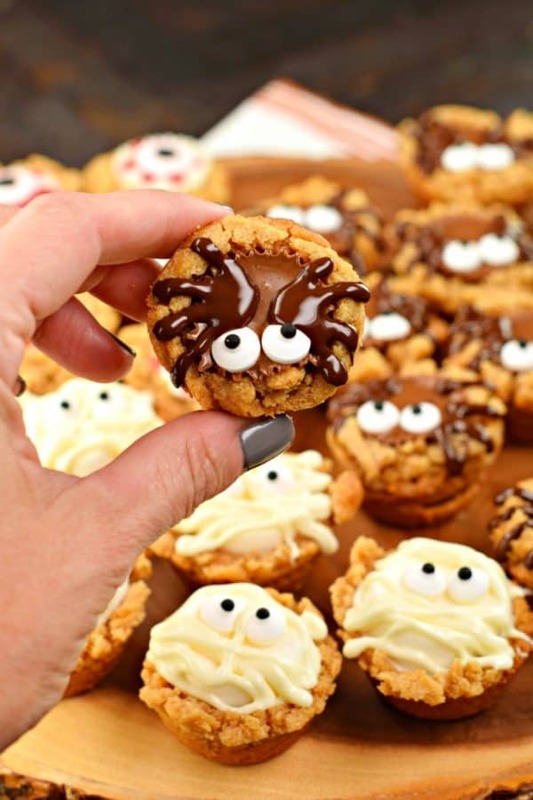 For the spider: you can use either a peanut butter cup or a rolo for these fun treats. Then press your candy eyes on top and use melted chocolate to create the legs! For the bloody eyeballs, you can use either a white chocolate peanut butter cup or marshmallow. Then use red gel to create the bloodshot look and the big candy eyes! 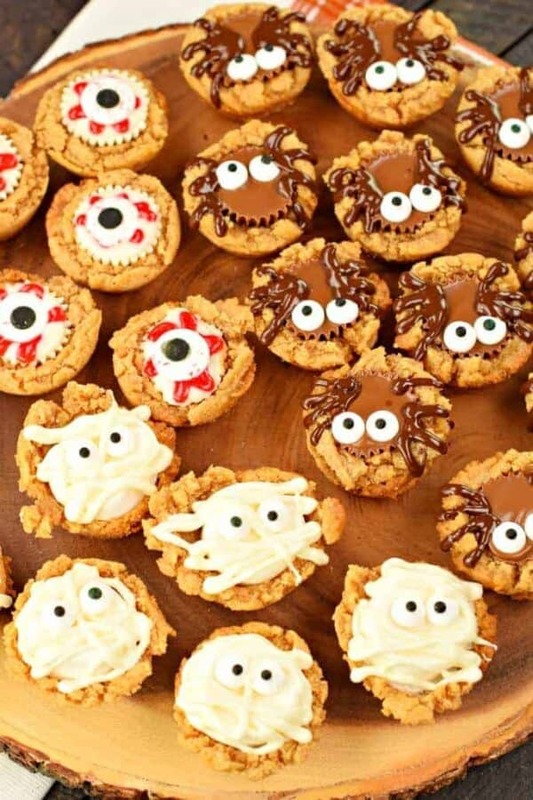 Still on the hunt for more Halloween party ideas? I get lots of comments when I bring this pumpkin to parties! And the guacamole is amazing too! 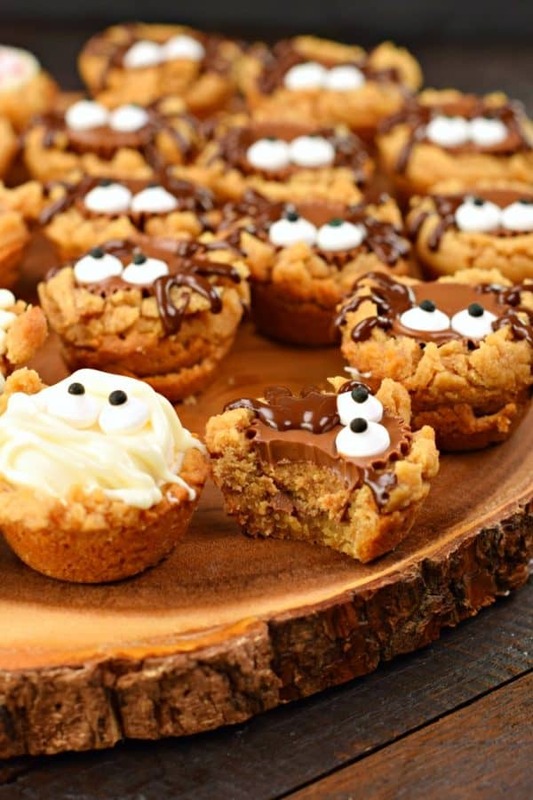 These Spooky Brookies are a cinch to make, and delicious to eat! This Spooky S’mores Pizza is a great dessert idea for your Halloween Party. I mean, who wouldn’t want to grab a slice?? Go savory and bring along this Spooky Taco cheese ball. I’m obsessed! 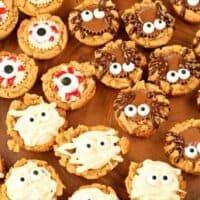 Friends and family will love these Monster Sugar Cookies! 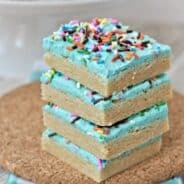 Great for parties, bake sales, and lunch boxes! 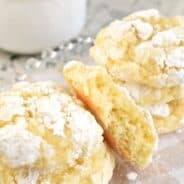 Need a low carb dinner to go with low carb cookies? This Easy Low Carb Keto Zuppa Toscana soup is a delicious hit! Preheat oven to 350°F. Spray mini muffin tin with baking spray. Set aside. In a bowl, combine peanut butter, sugar, and egg. Mix until well blended. Using a 1 Tbsp cookie scoop, drop by spoonfuls into tin. Bake for 12-14 minutes. Decide which design you will make (if you're making a little of each, adjust ingredient amounts accordingly). Remove pan from oven and immediately press your Reese's or marshmallow half into the hot cookie. Begin decorating (see video above for steps)! ENJOY. STOP STOP STOP these are too cute!!! What a delightful party food. Ingredients promise the cups vanish in a speed of light ! Thank you !